1. Lock yourself in a closet. 2. Sew your mouth shut. 3. Wear a shock collar that’s sensitive to sugar particles. 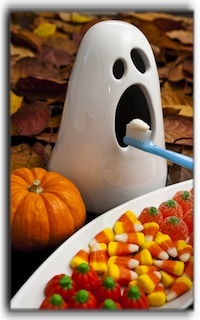 At Salt Lake Dental Care we understand how hard it is to avoid sweets altogether at Halloween and other sugar-filled holidays. We encourage both unfettered joy and healthy living for all of our Murray patients. Moderation in candy intake can help with the prevention of dental caries (cavities), but so can consistent brushing and flossing and regular cleanings and checkups at your Salt Lake City family dentist. Keeping the mouth clean and being meticulous about oral hygiene are strong indicators for a happy mouth. We’re not here to tell our Murray and Sandy, UT, patients to avoid sugar altogether. We’re not even here to tell you just to sneak a little. Eat as much as your child will let you; just be sure and brush thoroughly – same as any other time of year. Keep in mind that eating a candy bar and then brushing is better than sucking on a lollipop for half an hour. When it comes to caring for Murray, Utah’s teeth and cosmetic dentistry needs, Dr. Clint Blackwood works tirelessly to make quality dental implants, general dentistry, and wisdom teeth removal available to this entire Utah community. Services such as dentures and cosmetic dentistry really set us apart from the competition. If we can help you with porcelain veneers or Invisalign clear braces, then we’ve done our job!